When BART cop Johanes Mehserle shot and killed Oscar Grant as he lay face down, handcuffed on a train platform he committed involuntary manslaughter, not murder. Or, so said a Los Angeles jury yesterday. With an involuntary manslaughter charge, Mehserle will face at least two years in prison and a maximum of six years, rather than the life sentence he would have faced if he’d been convicted of murder. As the verdict came in last night, here in New York I watched as one of the cruelest ironies played out in the press. While much of the blogosphere and almost all of my Twitter stream was filled with news of the verdict, the mainstream news media devoted its considerable attention to the faux-news money-making event of where a certain basketball player would decide to shoot hoops. The juxtaposition of these two black men – one shot dead by a white cop and the verdict in the trial of his killer largely ignored, the other bid on by some of the wealthiest white men in the country to entertain them — is striking. The spectacle of the press fawning over LeBron James while Oscar Grant lies murdered, dead and buried is says a lot about the way America wants to see black men: entertain us or your life has no value. New York City consistently has the highest number of shooting deaths by police in the country, an average of 12 every year. The city also has substantially disproportionate killing of Black people, who make up 26 percent of the population but represented 66 percent of those killed by police. Perhaps the most striking data of the period concerns the fates of active officers, on or off duty, found to have fatally shot civilians. Including all shootings–even cases where victims were unarmed–only one officer was convicted of wrongdoing. In 2005, Judge Robert H. Straus found Officer Bryan Conroy guilty of criminally negligent homicide in the 2003 death of Ousmane Zongo, a West African immigrant and art restorer who rented a storage room at a Chelsea warehouse where the NYPD was conducting a raid targeting a counterfeit CD and DVD operation. A jury trial had previously deadlocked when considering the case. In many ways, the murder of Oscar Grant illustrates an extension of the new Jim Crow in which black men who are not fabulously wealth basketball stars are regarded as dangerous, even when they are laying face down with their hands cuffed behind them. Just as important in the new Jim Crow is the notion of the white cop as hero-victim. Mehserle will, like other white-cop-shooters before him, get lots of press attention focusing on how difficult it is to be a cop (hero) and how “afraid” (victim) he was in his job (generally) and of Grant (specifically). The caste system perpetuated by the new Jim Crow is sustained by the white racial frame. In other words, the shooting of Oscar Grant and the near-acquittal of Mehserle is going to be legitimated and justified by a majority of whites who will talk about the ways that Grant deserved to be killed, or was a menace and the ways that Mehserle was honorable and just doing his job. For evidence of this you can check the comments at Serwer’s piece here, or pretty much any other blog or news site that’s writing about this verdict. And, as if to drive this point home, last night as the verdict came in and even before we’d posted anything about the verdict, we started getting racist hate mail through the blog saying all that and more. In an article in the January (2009) issue of The Progressive, political analyst Chip Berlet argues that the election of Barak Obama “has poked the racist beehive, and we can expect a lot of buzzing around in the months ahead,” (p. 27). Berlet notes the increase in racist incidents – e.g., cross burnings, arsons – in communities throughout the United States following the election, with the Southern Poverty Law Center noting that the rate has been far above “normal.” Berlet remarks that rightists of all kinds are “eager to reframe issues in ways that invoke racialized fears” among white citizens (p. 27). Interestingly, as I read this, I thought of the recent exchange on this blog regarding Jessie Daniels’ post on the Grant police brutality case. I think some of the reaction to Jessie’s analysis reflects the success of the previous political administration and various right-wing groups in convincing many of us that we have much of which to be afraid and from which we need protection. The law-and-order, lock-em-up approach to criminal offending in this country – so much a part of the “War on Drugs,” as well as the “War on Terrorism” – has garnered widespread mainstream support and resulted in a dramatic rise in incarceration rates such that the United States now has more citizens in prison than any other country in the world. Many people are convinced that the police must be aggressive in combating crime and catching “bad guys,” and in doing so, they may make some mistakes, but they’re “honest mistakes”; the police, after all, are “just doing their job” (image from here). Ironically, crime in the United States has declined fairly steadily since the 1990s, and many criminologists attribute at least some of this decline to the prosperous economy during this period. Given the current economic crisis, we can be fairly confident that crime rates will be on the upswing, and we are likely to hear an outcry for more police intervention. I doubt, however, if many of those who demand such action will be expecting law enforcement to arrest the “white collar” offenders on Wall Street who precipitated this mess in the first place, or those in the previous administration whose gutting of regulatory legislation helped fuel Wall Street greed. Such offenders are rarely considered “criminals” and their offenses aren’t viewed as “real crimes.” Instead of “crime in the suites,” law enforcement will be focused on crime in the streets, and those most likely to be caught up in any new “crime crackdown” will be those who are always the first targets of law enforcement: the poor, and racial and ethnic minorities who are disproportionately represented among the poor. But this time, we have a liberal Democratic president in office, who also happens to be African American, which returns me to my opening concern. If crime increases during Obama’s first term in office – and it most certainly will – rightists will likely use it to invoke racialized fears. No doubt some of the comments about Jessie’s original post on the Grant case were offered by members of rightist groups, who lurk on progressive blogs to try to disrupt the dialogue. I see this not infrequently on feminist sites when members of fathers’ rights groups post comments about women being as violent as men or claims that divorcing mothers falsely accuse their spouses of abuse. This, though, actually bothers me less than attempts to saturate the mainstream with racist fears. If rightists feel the need to infiltrate a progressive blog such as this one, we must be doing our work well; they’ve noticed us and we’re cause for them to be concerned. What is more important, then, is for progressives to be certain not to just talk among ourselves and to like-minded folks, but to discuss these critical issues more broadly and to debunk racist myths whenever and wherever we find them. In other words, we need to knock down the racist beehive. The BART cop, Johannes Mehserle, who shot and killed an unarmed Oscar Grant in Oakland on New Year’s Day, has been arrested and charged with murder. This is a rather stunning turn of events given the way that police brutality is usually ignored here in the U.S., as Joe noted in his recent post about the incident in Houston, Texas and the pervasiveness of police brutality encountered by emergency room physicians. As I said in the original post about this story, and as the voluminous comments attacking Oscar Grant revealed, the current system of policing is premised on institutional racism in which some citizens are treated as ontological suspects, that is, they are presumed to be guilty of some crime based solely on who they are, particularly young black and brown men. 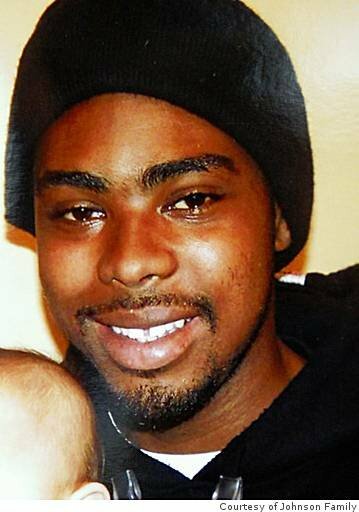 Although some may dismiss Oscar Grant’s murder as merely a tragic accident, the fact is that his death has everything to do with his race, and the fact that this made him automatically “suspect” in the eyes of police. The study, which I wrote with my research assistant, Jonathan Borowsky, asked not simply whether African Americans and Latinos are stopped and searched by the LAPD more often than whites — it’s clear that they are — but the more complex question of whether these racial disparities are justified by legitimate policing practices, such as deciding to police more aggressively in high-crime neighborhoods. For every 10,000 residents, about 3,400 more black people are stopped than whites, and 360 more Latinos are stopped than whites. Stopped blacks are 127% more likely to be frisked — and stopped Latinos are 43% more likely to be frisked — than stopped whites. 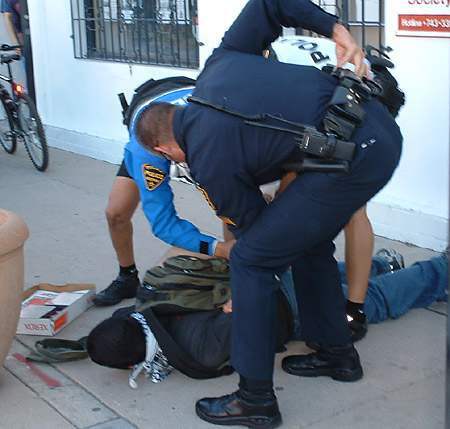 Perhaps in addition to “over-stopped, over-frisked, over-searched, and over-arrested,” we could add “over-killed.” The study, released in fall of 2008, initially drew only silence from the LAPD which refused to respond. And, when they did finally respond (just in the last several days), the LAPD chose to reject the reports findings, minimize the significance of the report, and deny the implications for reviewing its policing practices, by saying only “we live in an imperfect world” (according to Police Chief William J. Bratton). It’s my hope that the street protests in Oakland ( photo credit: NeitherFanboy ) will be part of a broader and more sustained effort to address the racial profiling and police brutality that are endemic in the contemporary U.S.
Like many of the readers here (h/t: Victor, Ilish), I’ve been following the news of the shooting death of Oscar Grant, III (photo from Facebook) in Oakland, California by a transit cop. At the time of the shooting, Grant was unarmed, on the ground, his hands were hand-cuffed behind him. Grant was employed as a butcher at Farmer Joe’s Marketplace in Oakland, had a young daughter, Tatiana, age 4. Several people at the BART train station recorded the incident on their mobile phones, and witnesses reported that Grant begged officers not to shoot him, telling them he had a young daughter. The BART cop who shot him, Johannes Mehserle, has since resigned his position, thus avoiding internal affairs investigators. And, lawyers have filed a $25 million lawsuit against the transit authority on behalf of Grant’s family. 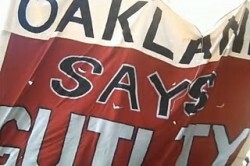 As Grant was laid to rest today, protestors gathered at the Fruitvale BART station where he was killed to demand justice (update: the protest prompts The New York Times to take notice). I suppose the good news is that the other members of that Facebook group called out Crook for his racism. At this point, no one knows whether or not Mehserle held these kinds of overtly racist views. And, to some extent it’s beside the point. Whatever Mehserle’s individual level of racism, Grant is still dead because of racism. The racist idea expressed by Crook that some lives are less valuable than others is one that pervades our institutions, particularly criminal justice institutions, and operates without individual racists. Institutional racism assures that some people, particuarly young black men, are continually viewed as suspects and are perpetually vulnerable to assault by police. As I mentioned, there are multiple videos of this shooting taken by concerned passers-by. This may persuade some that there is incontrovertible evidence of this outrageous, criminal act. But, the institutionalized racism that creates black men as ontological suspects has already started denying the reality of this mobile phone video evidence. In one report, there’s mention that Grant possibly had a criminal record; in another, a BART spokesman calls the video evidence is “inconclusive”; and, reports are painting Mehserle as sympathetic for a variety of reasons, including the fact that he is getting death threats. For observers of racial politics in the U.S., this should all sound eerily similar to the kinds of strategies used in the trial of the LAPD cops accused of beating Rodney King. As you may recall, even though there was clear, stomach-turning video of those officers brutally beating and tasering the unarmed King, defense lawyers for the cops successfully portrayed King as a “monster” and a “thug” and cast the officers as “victims” who felt threatened by him. All the officers were acquitted of beating King, and if past is prologue, I expect Mehserle to walk without criminal prosecution. The sort of citizen journalism and activism of cop-watch style actions are promising for addressing brutal acts such as the racist murder of Oscar Grant. Yet, the lessons of racism in the recent past are that these are important, but not sufficient in and of themselves to bring about justice. For that, we must work much harder. Take action.